Vogue prom is what it is called and it is by far the best red carpet of the year. People take risks (some that pay off, some that horrifically do not), which always makes it more entertaining than the Oscars and everyone goes. At least everyone on Anna's good list. Oh how I covet a spot on that. Until then, I can shamelessly critique from afar. The theme this year was a nod to Chinese culture. 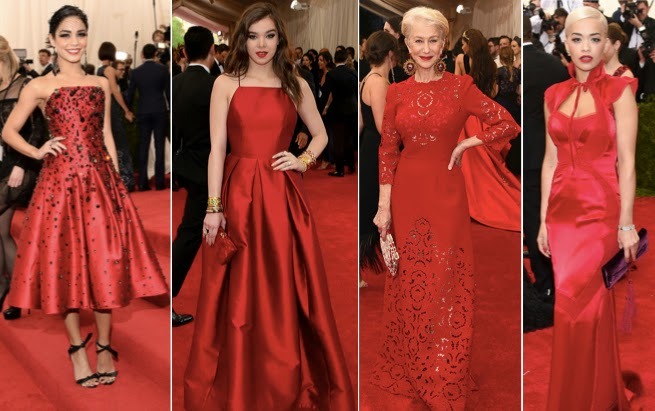 So there was a lot of red, which can be so hard on a RED carpet. ha Some pulled it off, including a few of my top of the top Best list. From Left: Jessica Hart gives a nod to the theme in such a gorgeous way. Bee Shaffer is so elegant in this garnet. The cherry blossoms are so pretty. Kate, always the golden girl, killing it in Michael Kors. And I know you might hate it, but I love Sienna's suit. The tassels, the cut, only she could do it. Maggie rarely gets it right, and this is a bit off, but somehow I love it. Amanda looks gorg in Givenchy. This Donna Karen on Lizzy Caplan is so regal. And while Rosie's dress is a bit severe, she looks insane. In a good way. Kristen has really never worn anything so feminine. This yellow is pretty on her. This green feathered Altuzarra on Keri really belongs at the top. It is stunning on her. Kendall looks pretty in this green, which is actually a strange color. Emily Blunt brings the perfect chinoiserie in Parda. There was little black, but I thought these were all great options in a sea of red. Such a sucker for blue and white on Ivanka. And I have been dying for someone to wear this silhouette from the Giambatista Valli show. Love it on Allison. Kerry's bubble gum dress, not my fav. I think Vanessa's shoes are what sell me on this look the most. Hailee looks like she did her own hair, but I like the dress. Helen slays it. I want to borrow that dress. And there are few people that could pull off Rita's dress, but she carries it so well. There were some good looking couples there. Olivia Munn's sleeve kind of bugs, but I like the dress. The Firth's look insane, per usual. And Chrissy and John look elegant and cool. Let's begin the not so great looks with this one..
Every time I see the Olson twins (who I admire and actually like their style so much) it reminds of the ballroom scene on the Haunted House ride at Disneyland. Right? They never look happy, they dress so frumpy, and the weirdly matching component is not good. Like they are being paid to scare us a little bit. Ashley (?) on the right, her dress could be stunning solo. And then there is the ever ending quest as to who can show up the most naked to an event. When will this end??? This is not a dress for the Met. It is a Vegas show girl costume. She had to show up last, she had to show up naked, do we really need to see this much of someone? Save it for your show, lady! So there were some ladies that really went for it. And while I admire it. I really do, none of these hit the mark for me. SJP's dress looks cheap (it is H&M, so maybe it is?! insert cringe face). Anne's hood is like half on and a weird shape. Solange. Where do I being? She looks like a dress up ray at Sea World. 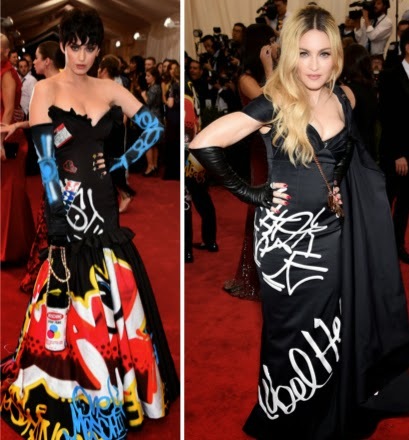 And the shape of Gaga's dress is all around bad. Love me some volume, but not everywhere. I cannot get behind this. It is just too much. The color, the fur, the head piece, the amount of fabric. It is hard to look at. Underneath this was a pretty red gown that I think was better looking. Jennifer Lawrence looks really pretty, but this dress bugs. Can't even put my finger on why, but it does. Elizabeth Banks also looks rocking, but cheesy for this event. Kim went for it, and honestly it is not that bad, just kind of over this dress since we have seen it before (right, Beyonce?). And Jennifer's dress looks like a suit of armor. If it was short sleeved I think I would love it. J. Lo had a dragon slithering up her body. While there is no denying her amazing bod, I think we have seen enough of it by now, right? I am just kind of over the "gravity defying" cut outs. Much like Miley's here. At first glance, I actually really liked Emma's, but that belt started to bug. But now maybe I like it again. Too confusing. Reese is such a snore fest. It is a gala girls. The MET GALA. Wear a freaking gown. ps: Miranda's sleeves and Chloe's choker might be the worst things at this event. Guess what? No one won. Diane Kruger is one of my style crushes and even though this is Chanel, I can't. Lace pants? No. Eddie and his wife have been killing it, but her Valentino is not doing it for me. Olivia Wilde's choice of gloves and is that a headband? It is so confusing. And I do not know who this girl is, but her dress is freaking me out. And R. Pats tie? Not a good look. What did you think? There were so many, I could not even include it all! Would love to know your thoughts. I really like the dress. I'm size 14 I first order an extra-large and it seemed small for me. But they do customize the dress. When the dress from best women's designer brands came in it was simply amazing and exactly like the picture posted. We attended an event here this past Sunday & had an awesome experience from beginning to end. They served great food and the salad I had for dinner was delicious. The service at LA venue also was impeccable.